Just as I was beginning to wonder if Chrysler had lost it, along came two weeks in two decidedly different – but worthwhile – vehicles: the Dodge Avenger and Jeep Patriot. A while back, I dumped all over the Dodge Nitro SUV, about which I could find little to love. Since then, I've seen more Nitros on the streets than I can shake a stick at, which just goes to show how important my opinion is to people in the real world. How dare people make up their own minds! So much for the power of the media. Actually, that's a good thing. But I get paid to prattle, so here goes. 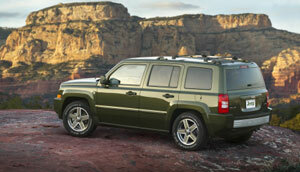 The Jeep Patriot is the closer of the two vehicles to the Nitro, so let's start with it. It's the base Jeep, kind of a spiritual successor to the Cherokee I guess, and it seems like a pretty decent value. Patriot starts off well: it looks like a real Jeep, with its round headlights and slotted grille, boxy body panels and unapologetic SUV look. The vehicle looks rugged and serious, and that's not a bad thing for aa Jeep. 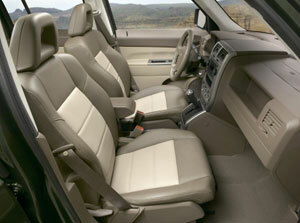 Inside, the Patriot is roomy for four and nearly roomy enough for five, and it's comfortable for all day driving. We packed five people and picnic stuff into it and sallied forth into the Rocky Mountains for a day of mild off roading (dirt and gravel, not really heavy duty stuff), and had a ball. Patriot's power comes from a 2.4 liter four cylinder engine rated at 172 horses and 165 lb. ft. of torque. This is fine for two passengers, but when we hit the hills with five people aboard the acceleration provided little exhilaration. Getting up to highway speeds seemed to take forever and passing slower vehicles was aided only by the fact that there were few slower vehicles around at the time. Perhaps Jeep could offer a V6 soon, with maybe 250 horses or so? The four banger in my 4x4 Limited tester was mated to a five speed manual transmission, and I liked it a lot, though at times I had trouble finding reverse and my wife had trouble finding fourth. But the shift feel is just fine, as is the clutch. A CVT is available, if you prefer. The Patriot is held up by an independent suspension, steered by power-assisted rack and pinion and stopped by four wheel discs. Handling, steering and braking are all more than acceptable and never during my week with the Patriot did it feel anything other than safe and secure. Kind of fun, too. The front seats adjust manually, and they're comfortable, supportive, well bolstered for cornering – and my tester's came with bun warmers. 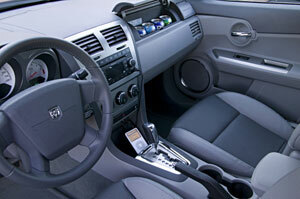 Rear seat customers can take advantage of a seat that reclines and is quite roomy for two. The poor soul in the middle may find the shoulder belt digs into his neck, but that's what you get for not calling "shotgun" before the vehicle gets fired up. The rear seat also splits and folds flat with the rubberized (or some such coating) rear storage area. Controls are simple and well laid out. The turn signal indicator takes a good shove to activate, but the instrumentation is straightforward and the HVAC controls are a model of simplicity. And the power window controls on the driver's door armrest are placed perfectly. The Boston Acoustics Audio system is good, with plenty of power and good sound quality. Party animals will like the fold down speakers that hang from the Patriot's rear hatch; they'll be great for when you're tailgating or camping, as long as you travel armed if you're planning to tailgate or camp where others are also hanging out. My tester wore Goodyear Wrangler SR-A P215/65 series R17 M+S tires on its 17 inch, five spoke wheels. 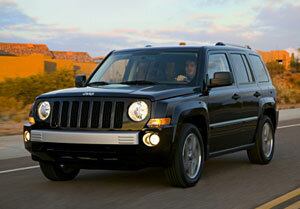 The Jeep Patriot starts at $15,110 U.S./$16,995 Canadian. The Patriot 4x4 Limited starts at $22,115 U.S./$24,435 Canadian. Dodge's Avenger is a conventional mid-sized four door sedan that looks kind of like a smaller and a bit more subtle Charger (not a bad thing). It's quite attractive, visibly a Dodge (if that's important to you) and gives reasonable driving pleasure for its price. Whether it's as good as, or better, than its competition will surely be settled objectively by the marketplace. I got to test the R/T trim level, which in days gone by meant the vehicle would be hot. Heat is relative; I like colder temperatures than my wife, but when it comes to cars our roles reverse. The Avenger is her kind of hot, as is the Accord and Camry – fine cars, indeed. A 911 is mine…. The base Avenger comes with a 2.4-liter four cylinder "World Engine" featuring dual variable valve timing and putting out 172 horses @ 6000 rpm and 165 lb. ft. of torque @ 4400 rpm. My R/T came with the 3.5 liter V6, which is much more satisfying and, well, hot. It cranks out 235/232 horses/torque and is coupled to a six speed automatic with a manual mode that, curiously, shifts side to side and, curiously, often shifts when it pleases, seemingly. Power is more than adequate, as is torque. Watch for some torque steer and engine noise, though. Avenger also keeps avenging thanks to its independent suspension front and back, four wheel disc brakes with ABS and decent feeling rack and pinion steering. All wheel drive is available. The Avenger drives nicely, but in an Accord/Camry/Sonata kind of niceness (which I guess means it's just right for its target audience) but the interior isn't up to the standards of those competitors, at least so far as its rather cheap-looking plastic pieces and inside door handles are concerned. The driver has a nice place in which to work, with a good-feeling steering wheel, straightforward instrumentation and controls, and good seats (my tester's were leather and heated). The driving position is good, though the sun visors seem cheap and the vanity mirrors look as if they were an afterthought. The stereo rocks, though it's a tad bassy, and there are volume controls and the like duplicated on the steering wheel. I was surprised to see it play DVD's, even though there was no DVD screen (one is available); this let me bring my DVD Audio discs aboard and listen to them, albeit in "dumbed down" Dolby Digital rather than their native format. But it was better than most cars offer. Storage space abounds, including dual glove boxes (the top one also functions as a cooler; the lower one can hit the passenger's knees). Headroom is good; I felt as if I could sit on a booster seat and still not hit the roof. Visibility is good until you try to shoulder check, at which time the big C pillars get in your way. You can get around this by adjusting your exterior mirrors better, though. You get the creature comforts and safety features you'd expect, including keyless entry, one touch up/down front windows and a gaggle of airbags. I have no idea if the Avenger will carve enough of a niche to help Chrysler's new owners pay off the mortgage, but it seems like a reasonable attempt. I'm not convinced it's up to the quality of its major "foreign" competition, but it was definitely a pleasant surprise after that blasted Nitro. 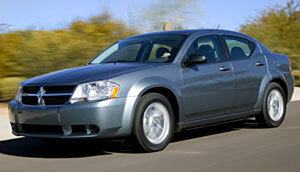 The Dodge Avenger SE starts at $19,020 U.S./ $21,995 Canadian. The R/T starts at $23,670 U.S./ $28,895 Canadian.